If silence attracts you; if your mind wants peace, Vesak 2018 Buddha Purnima meditation is for you. Vesak festival is on April 30 in the Capital of India, New Delhi. This is the day when people believe that Buddha descended on Earth. Vesak, also called Wesak, is a sacred ceremony. It falls on the same day that Lord Buddha was born, attained enlightenment, and left his physical body. The ceremony takes place on the full moon day of Vaisakh (Indian month). This is an auspicious holiday for the Buddhists. They believe that meditation done on this day has a lingering effect for 365 days. The original place of the ceremony is a remote valley in the north part of the Himalayas near Lhasa and Nepal. A legend goes that the Great Beings come together on this day to be a part of the flow of the Divine Energy to execute the Divine Plan. The ceremony touches various planes of consciousness: spiritual, mental, emotional, and physical. According to a belief, disciples participate in the ceremony with their mental plane of existence, spiritual disciplines do so with their astral bodies, while more advanced souls do so with their spiritual bodies. When you attend Vesak 2018 meditation ceremony it is possible that you may not remember the experience later. According to Master Choa Kok Sui, irrespective of whether your brain registers the event, you definitely get spiritual benefits. Wesak 2018 ceremony features the use of symbols. The Great Beings position themselves in the innermost circle while the younger beings are at the outermost circles. You can hear the sound of Great Invocation just a few seconds before the full moon appears. According to the belief, Lord Buddha transmits energy to the Christ. He transmits it to the Great Beings, who pass the energy to all others present in the ceremony. This could be only for 60 seconds, but these seconds are so powerfully charged with energy that they last eternally. You need to prepare your mind to absorb the Divine energy on the full moon day. Remove all negative thoughts. Make room for the Divine energy to enter you. Try to feel good and happy so that you are ready to absorb the vibrations emitted during the meditation. Believe. Distribute the spiritual energy and blessings that you receive during this meditation to other people through group meditations and sessions of blessing and healing. Do this during the 2 days after the Wesak 2018 ceremony. 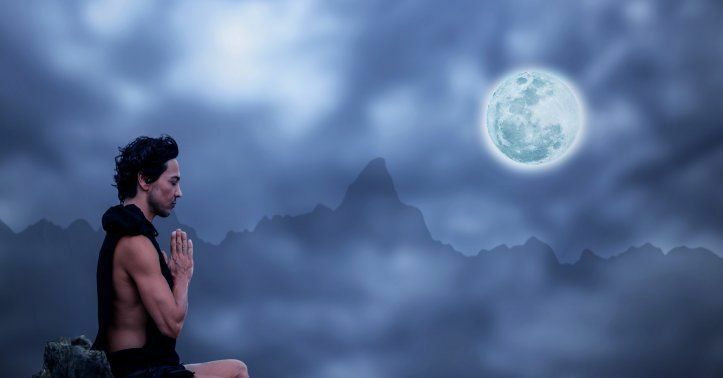 Even if you do not remember the event, which can happen as mentioned earlier, you can still pass on the Divine energy that your senses absorbed during the full moon meditation. In conclusion, the Vesak is a 5-day ceremony. The first two days are for preparation for the ceremony, the third day is the ceremony, and the last two days is for distribution of the acquired spiritual energy. TIP: To maximize absorption of the Divine energy during Vesak full moon meditation ceremony, you must put aside your ego, harbor a positive attitude and a will to help others. Do you know planet Earth and its satellite Moon pull each other like magnets? Moon exerts a powerful force on Earth and Earthlings. Meditation ceremony like Vesak 2018 on this day can add to your mind power. It can calm your mind and help you get in touch with your spiritual side. Do you know the moon creates tides in an ocean? They happen due to the gravitational pull of the moon on the Earth. The human body comprises 70 percent of water. So, if this Satellite of Earth can create waves in a water body, it can influence a human body too. Studies have proved that the moon influences mind and body. Scientists call it the "lunar effect." You may feel restless on a full moon night, experience a surge of emotions, or maybe go "crazy" as some say. A research reveals that moonlight causes a rise in melatonin levels in the body. This is a hormone that the pineal gland secretes to regulate sleep in humans. Researchers say that sleeping under a full moon can give you a good sleep. There is evidence that shows that people who slept in a room flooded with moonlight experienced balanced hormones, while those who slept in a room with artificial lights experienced imbalanced hormones. Moreover, doesn't it feel nice when the cool white light envelopes you? You feel as if the divine is touching you. When a simple act of sleeping or sitting under moonlight can do so much to your senses, imagine what a guided Vesak 2018 meditation can do to you! You may have heard of people going crazy on full moon nights. Movies and novels promote this belief. But there is another side to this beautiful, white, heavenly object located about 252,000 miles away from Earth. Scientists have proved that the moon creates a healing effect on the mind. On one hand, it can heighten your emotions. On the other hand, if you know how to harness the moon's energy, it can soothe your senses and help you attain bliss. Vesak 2018 can help you harness the Divine energy. Full moon meditation can help calm your mind. If you know how to make the most of moon energy, you can have a beautiful experience on a full moon night, instead of becoming "lunatic." Due to the moon's pure look, it seems like a divine being in the sky. The Hindus regard the moon as sacred. Many of the Hindu festivals follow the lunar calendar. Sri Sri Ravi Shankar has said: "A mind that is calm, without hesitation and anticipation is meditation." So, if you have never meditated under a full moon, here is your chance. Be a part of an intensive spiritual ceremony on Buddha Purnima that falls on April 30 this year. Attend Vesak 2018 meditation ceremony at Indira Gandhi Indoor Stadium from 5 am to 7 am on this day. It's a unique chance to unite with the universal energy. To get more tips on meditation, please click here.